For years we’ve all been told not to keep medicines in the bathroom because the heat and moisture may destroy them. Now, homeowners have a way to break the old rules. Biszet, a German manufacturer of quality medicine cabinets, worked with pharmacists and dermatologists to create a medicine cabinet with three temperature zones to provide correct storage for creams, lotions and medicines. 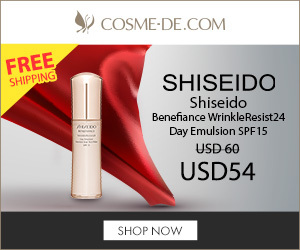 The first zone is ideal for storing products that contain vitamins such as anti-aging creams. Kept at 5-8 °C (41-46 °F) creams are less likely to separate. Chilled creams also feel pleasant and cause the skin to tighten and improves circulation. Biszet cabinets are made of stainless steel and glazed glass and come with a lock to keep medications secure. A free-standing model is also available. Another medicine cabinet with cold storage will be available soon from Robern. It’s not surprising that this leader in bathroom storage solutions should add a refrigerated compartment to it’s already impressive line-up of features such as interior outlets, door defoggers and night lights. Half of the 8-inch deep, 20-by-30-inch cabinet will be dedicated to cold storage at 42-50°F . 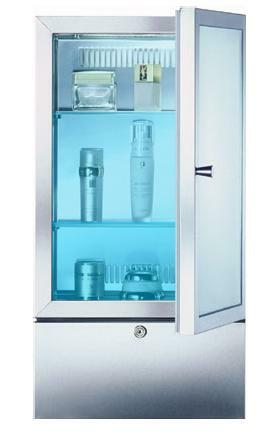 Just like the Biszet cabinet, it will allow users to extend the life of high-end cosmetics, maintain the quality of health and wellness products or simply keep beverages chilled and handy. The other half is for toiletries that do not require refrigeration, like toothbrushes, soaps or towels. The Robern cabinet can be installed semi-recessed or surface mounted. It has interior shelves to maximize storage and a handsome mirrored front door with a minimalist style that enables it to complement the other design elements of the vanity or room. Get a sneak peak of the Robern here. What a great idea! I can’t believe someone didn’t think of this sooner. How much do these medicine cabinets cost? I bet they’re pricey. You will pay about $3,500 for these little guys. If room is not an issue I’d probably rather have a beverage center.